STOP IT RIGHT NOW: LET'S HANG! While we all wait for Summer to kick in, here's a fun event to pencil into your Spring calendars! Come hang with me for a VINCE + ELLE shopping event. You can drink some special dranks, try on stuff, and listen to so super tunes by my bud So Super Sam. Interested in looking like a Pom-loving tomboy business lady hybrid like me? Or a first date look? Third date look? Or want to look sharp for your next meeting? I'm flexible! I'll be there to give some styling tips. See you May 8th? 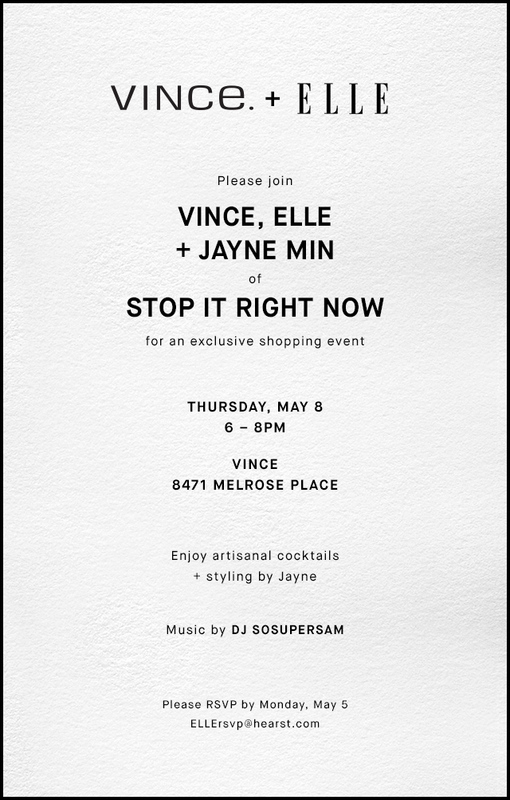 Follow @VINCE and @STOPITRIGHTNOW for updates on the event.